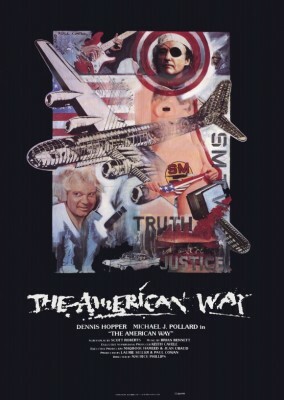 Commended at the 1987 Avoriaz Festival, The American Way is a grotesque anarchist farce released during the Reagan era, and the first feature film directed by Maurice Phillips (Another You, Enid Is Sleeping). Along with a rock’n’roll soundtrack, the film features Michael J. Pollard (seen with Rob Zombie), Eugene Lipinski (Rollerball) and an impressive Dennis Hopper. A very actual film... That should be shown in a double bill with Idiocracy with tickets refunded by health care !! !